Above: The touring cast of “The Phantom of the Opera.” Stock Photo. There is nothing more magical than seeing “The Phantom of the Opera” on the stage for the very first time. Between the extravagant costumes, off-the-chart vocals and that dazzling chandelier, there is so much to keep one entertained for the two and half hour run time. While the latest production still has all of those factors, there are definitely some changes. SPOILER ALERT: There are some spoilers below, but this show has been around for over 25 years. The set has been updated to circle around the stage to present different areas of the theater in which the events of the show take place. The circular set can also split in half and slide to either side of backstage when the whole stage is needed. The new setting allows for different staging than previously seen. For instance, when the Phantom and Christine are going down the depths of the theater to his lair during the title song, doubles of the actors have always been cast because there is not enough time for the actual Phantom and Christine to make it down, go backstage and get on the boat that then comes on set from the back of center stage. Now, the Phantom and Christine can walk down the spiral staircase as it turns, symbolizing the depth of the theater, and get in the boat which comes out from stage right. This staging also affects stagehand Joseph Buquet’s death. The splitting of the circular set allows the ballet scene to be split in half, so half of the stage is the ballet and the other half is the rafters where Buquet is working. Because Buquet is standing directly on stage as the Phantom goes to hang him, the actor is lifted up on the lasso rather than being dropped from above. Another big change with the set is that there is no grand staircase during the Act II opener, “Masquerade.” Unfortunately, the number suffers from the lack of stairs, which made the choreography so grand. The entrance of the Phantom at the end of the number is weak because he does not have the intimidating appearance above them that he is supposed to have. SPOILER ALERT: If you really don’t want to know the end of the show, skip the next two paragraphs. Perhaps the biggest change in the show is the final scene in the Phantom’s lair. 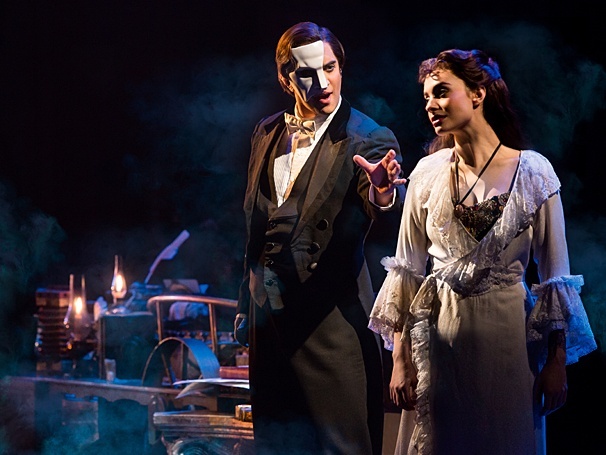 When Raoul and Christine are leaving the lair, Christine comes back to give the Phantom a ring back. Instead of handing it to the Phantom for a final emotional moment between the two, Christine leaves it on his desk and runs away before he could turn around and see her. Then, instead of sitting on the chair and putting a cloak over himself, Meg Giry runs in and sees the Phantom. Previously, Meg never actually saw the Phantom, but this time around, Meg and some of the people tracking down the Phantom actually see him. He then puts his cloak over his head and Meg runs to tear it off of him, but he has mysteriously disappeared. While the effect was still amazing, it was a little awkward having other characters onstage at the same time. Esteemed producer Cameron Mackintosh is presenting this tour as “The New Production,” which runs through August of 2015. Seeing as the production’s first tour started in the US in 1991, it is time for an update. “The Phantom of the Opera” is the longest-running show on Broadway and one of the most renowned musicals in the world. People have loved it just the way it was for years. While some of the new changes work, some of them do not. The ones that do not stand out and leave more of an impact than the ones that do work. As a true fan of the show, I do not believe that something that is working so well should be changed.